Last week’s FPU lesson was “Dumping Debt,” which was rather different from what I expected. Dave spent a lot of time talking about the disadvantages of various kinds of debt and not as much as I thought he would on the mechanics of the debt snowball. Of course, credit cards were pointed out as a particular evil, not just in the video but also reinforced by the class exercises. One exercise was to stand up and explain to the class either how your life works fine without credit cards or why using credit cards is vital to your life (I think that question was asked with some sarcasm). The second exercise was to volunteer to cut up your credit cards. You all know, of course, that Kyle and I use credit cards in what would be considered a responsible manner by anyone who is not a fanatic. I know that the students in the FPU class are there to get Dave’s teachings, which we definitely give them, but I also don’t feel comfortable lying about or concealing my own financial habits. How we handle our money does come up from time to time in the discussions. Our course leader also uses credit cards – paying them off every month – which he was open about during the class. It was very interesting to me to talk with the course leader and other table hosts about their credit card habits. Some of them don’t use credit cards at all and really question why anyone would – I suppose to them even responsible use seems to be asking for trouble. Others of us use credit cards but pay them off every month (and in our case, we use them exactly like debit cards) and don’t see any issue with that. As a credit card user, it felt pretty strange to me to be defending their use. Like, I’m on the “pro-credit cards team” or something! I don’t want to be pro-credit cards because I don’t think that everyone should use them, I just think that people who do use them well shouldn’t have to be on the defensive. Several people in our class stated that they do not use credit cards and their lives run fine. The people who stood up to say why they do use credit cards – brave souls, in that context! – made what I thought were very good points. One person had experienced a fraudster cleaning out her checking account back when she was using her debit card, and the hassle and time it took to get her money refunded by her bank has caused her to switch exclusively to using credit cards for their greater protections. I think this is a very legitimate reason to be using credit over debit. Dave also talks in his Dumping Debt lesson and frequently on his radio show about how having a credit score is not essential to life and all a good credit score means is that you have paid the banks lots of interest. I am very skeptical of this opinion, though of course not having lived without a credit score I can’t say for sure that my life wouldn’t function. However, as a renter and future mortgage-holder my credit is frequently checked, and I know many employers check as well. Dave can rant and criticize them all he wants but it won’t change their practices, and while you may be able to find someone to rent to you without a credit score it’s likely that your options will be limited. In addition to those advantages, there is also the whole rewards system, which is a nice perk. But I don’t want to go overboard on the pro-credit card hype side of things. If you want to behave badly or be careless with your money, credit cards can amplify the trouble that you get yourself into. Personally, I was afraid of using credit cards when I signed up for my first one (which was “for emergencies” that thankfully never happened) so I used debit almost exclusively for the first three years of my financially independent life. I didn’t trust myself to not go into debt so I only used the credit card for an occasional purchase to show some activity (and always paid the balance off by the due date). Through that experience, I learned to trust my money management skills, and when Kyle and I got married I switched to using credit cards whenever possible. You have to be really sure to not get carried away with the pro-credit card hype, either. People who push credit cards as part of their livelihood may get a bit over-zealous as well. One of the myths out there is that it’s advantageous to carry credit card debt to increase your credit score, while in fact the larger the difference between your balance and your credit limit the better for your score. Basically, credit score-wise it’s best to have lots of available credit that you don’t use. It is also my opinion that you should not use credit cards to enable you to live beyond your means, for instance by financing a large purchase at 0% for a year and trying to pay it off in installments, or by purchasing something that you can’t pay for until after your next paycheck comes in, even though you would not be incurring fees or interest if you execute those strategies perfectly. And you certainly shouldn’t spend more than you normally would just to rack up more rewards! Even chasing rewards may turn into more hassle than it’s worth – it all depends on how organized you are, how predictable your spending is, and how many cards you can keep in rotation. Kyle and I generally prefer cash back rewards cards to travel rewards cards because of the ease of redemption, even if the travel cards could ultimately provide more rewards. If you are churning cards for sign-up bonuses, you have to be very careful to meet the minimum spend requirements and to cancel the card when it is no longer useful to you (if there is an annual fee). If you keep cards for long-term rewards or perk potential, you need to periodically re-evaluate if the offered rewards still match you spending habits (and that they haven’t changed). My conclusion is that the use of credit cards is a personal choice. I certainly don’t think everyone has to have one, and I think that people who use credit cards responsibly should not have to feel defensive about the practice (even in FPU!). We should help educate people who use credit cards irresponsibly as to why they are so damaging and how beneficial it would be for their finances to stop using them. Those are the people who really need to be preached to, not those of us who use credit cards exactly like debit and don’t even spend more than when we use cash. Have you ever felt defensive about your choice to use credit cards? If you don’t use credit cards, do you think that no one should? How do you keep yourself from getting carried away with the perks of credit cards? 35 Responses to "Don’t Buy into the Pro- or Anti-Credit Card Hype"
Where we are now, I think credit cards are an inevitable part of our lives. The sooner we realize this and adopt more responsibility in their usage the better off we’ll be in our financial lives. Despite the arguments of most anti-CC users, credit cards certainly have numerous benefits if used properly. Oh, I think it’s very possible to opt out of credit card usage, especially for someone who already owns a house. But if you choose to use them, you should realize how you can avoid trouble completely and what practices are skating the edge. I guess I’d be in the same position as you if someone asked. I used to think it was weird that everyone else used credit cards when I Didn’t. Once I realized that you needed a good credit score to rent an apartment and get a mortgage, it was a pretty simple transition for me. As far as credit card rewards go, I make about $20/mo. It’s nice, but I would easily give it up if I was getting into debt or something like that. You are right – it is vital to not become addicted to the rewards! Ramsey always seemed a little crazy with his super anti-debt stance. He’s the only person I know that I’ve ever heard suggest that the average person can save cash to buy a house debt free. Of course, he also seems to think that the average person can save $10k per year towards that goal. I’d like to see him try that on MY income. I got into trouble with credit card spending before, but being more mature, I expect to use them more wisely once I get my debts paid down. As you’ve talked about in the past, using a rewards card to buy regular expenses is basically free money. Good for you for abstaining from credit cards for a time. Having been burned once I’m sure you will be very diligent to be responsible with them. I think you need to take a balanced approach with things like this. Obviously some people have a lot of trouble using them responsibly and would be better off leaving them alone. Others, like you guys, can use them responsibly and take advantage of the benefits they offer. I do hesitate just a little bit when I see people speak so strongly about the benefits of churning, not necessarily because I think they aren’t doing it right but more because it tends towards the side of potentially getting people into trouble. The main focus always needs to be on the long-term goals, not the short-term wins. Matt Becker recently posted..What is Net Worth and Why is it Important? Yes, I agree about churning getting a bit closer to potentially hazardous. That’s why we only very rarely get a card for the sign-up bonus. For the people who are struggling to be responsible with money or try to get out of debt, maybe thinking ‘credit cards are evil’ is the right thing. We don’t actually use any type of credit cards (only debit and the accounts have a zero overdraft), even if we’d not be too reckless with our spending. Anyway, I’d rather know it’s impossible to go over what I currently have in the bank, you never know what can happen. dojo recently posted..Blogging: Should you pay for comments? I like that idea as well. And having no overdraft on the checking accounts is key. We went through FPU and used only debit for a while. I think, honestly, that even Dave takes this with a grain of salt. I’m sure he doesn’t use credit but he must understand that there are a lot of people working his program while not adhering 100%, and trying to responsibly use credit cards. But a lot of Americans, and especially a lot of people listening to Dave Ramsey, have serious problems with consumer debt. It makes a lot of sense to just avoid credit cards at the start of this sort of program, so I can see why he preaches that approach. Once you’re out of debt, have an emergency fund, and are saving for retirement (step 4, I think) then maybe a more balanced approach would be fine for his FPU folks. 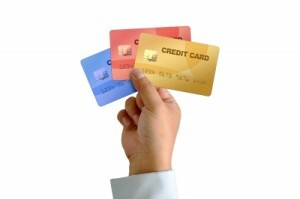 Done by Forty recently posted..Do Credit Cards Actually Increase Spending? I would hope that Dave is giving this anti-credit card message with a grain of salt, but I see/hear no indication of that. I think he has to be a true believer! I guess it’s hard to tell who will be responsible with credit and who won’t, but people who have been irresponsible in the past are good candidates for the latter. Yeah, I think for a very specific group of people, those for whom the Ramsey approach probably works best, not using credit cards is the right choice. It’s better to have no credit than to have bad credit. But it is better to have good credit! I agree – good credit > no credit > bad credit. We use credit cards responsibly and prefer to use them. The rewards are great and it’s easy to track spending. Michelle recently posted..How Much Was Your Wedding? Maybe try switching from cash to debit before going straight to credit? Just to see if you can control your spending as well with plastic as cash. We have never had credit card debt. We have had a couple credit cards skimmed, followed by fraudulent charges. It was easy to clear up with the credit card company. I shudder to think if it had been a debit card tied to our bank account. When we opened our current bank account, the bank sent us debit cards. I took them back and asked for ATM-only cards. Like you, we use credit cards as if they were debit cards, and never purchase anything with a credit card that we don’t already have money in the bank to cover. We never carry a balance. Another nice thing about credit cards are the rewards. We use our AmEx card that has a 2% cash back for most purchases. We have a Mastercard with 1% cash back for places that don’t take AmEx. We’ve had our credit cards stolen as well but we’ve always been satisfied with the speed of rectification. Is that Amex the Fidelity one? That’s a great deal! Yes, it’s actually run by BofA through some branch called FIA card services, but the card is tied to our Fidelity brokerage account. I am definitely on the fence on this issue. Having just gotten out of CC debt, I still struggle with “responsible CC spending”. But I know that it can be done, and you can also be rewarded for it. I’d say to give yourself a year without using credit at all to see if the lesson stuck! I definitely use credit (no balances). I got my first card while in college when I realized the importance of having a credit score. I encouraged my then boyfriend (now husband) to get some sort of card for similar reasons. The rewards are nice, and sign-up bonuses are what got us through this year of living quasi-apart, traveling almost for free. Plus it is just easier to me. I like to keep a kind of low balance in my checking account (with the bulk in savings), and a credit card lets me not worry about what account my money is in until I pay it. I also buy into the you-need-a-good-credit score zeitgeist. It definitely makes life easier. And you DON’T have to be paying interest to do it! Credit cards also work well in conjunction with our money management system of transferring money from savings into checking to reimburse for expenses as well. The safety issue is the one reason I NEVER use a debit card. People assume that debit cards are protected the same way real credit cards are and they aren’t! A bank could take their sweet time refunding you, and depending on their policy, you might not even get 100% of it back. It’s all about spending responsibly. If you can’t handle debt, stay away at least until you get things in order. But if you’re good with money and you have no type of debt (student loans, credit cards, mortgage) I highly suggest getting a credit card to pay in full each month to help your credit rating. I definitely think it’s a personal choice to use credit cards or not. I use my credit cards for everything and have never had a problem with credit card debt. I pay my bills in full each month and don’t charge things I can’t afford. If people have problems keeping their spending with credit cards under control they shouldn’t have credit cards, but if I want to have mine they shouldn’t judge me for it. To each her own.